Set in the Peak District hills and designed by renowned theatre architect Frank Matcham, Buxton Opera House – along with sister venue Pavilion Arts Centre – provides a wide variety of entertainment. From opera to cinema, stand-up to classical music, family theatre to contemporary dance, talks to musicals. Working from the existing logo and colour palette, we developed the venue’s digital visual identity – some of which has since been introduced onto printed materials as well. A balance of classic serif and modern sans-serif typography hints at history and heritage without appearing old-hat. Added to this, the elegant line-art icon set, simple venue illustrations, and pared-back user interface create a graceful, timeless design style. The website is easy for the team to update day-to-day, and works beautifully for visitors – whatever the device they’re using. 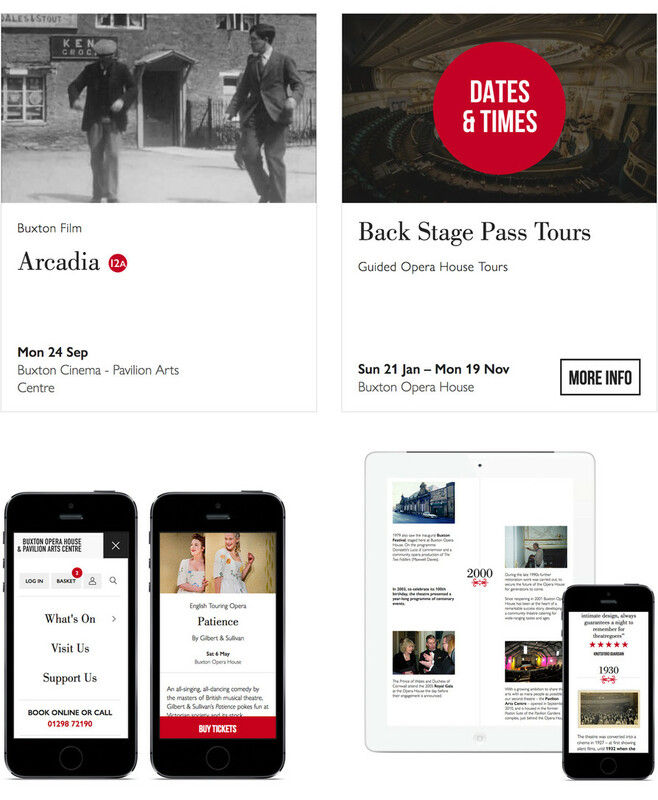 As internet access in the area can be somewhat hit-and-miss, the mobile experience is decidedly fast and lightweight – with quick, clear routes to buying tickets on-the-go (via Spektrix). One of our favourite parts of the website is the Our Story timeline. Here, the team add can text, imagery, video, and quotes relating to significant milestones and events in the venue's past. It’s an engaging, logical and easily-digestible way to explore Buxton Opera House’s rich and interesting history.